Sunday 28th April 2019 @ Morganstown with EDUARDO. where you can learn to dance Argentine tango with an Argentine. We run weekly group classes, private classes, monthly workshops and regular dances here in Cardiff. Classes are taught by Eduardo Bozzo, international Argentine teacher, dancer and choreographer from Buenos Aires. 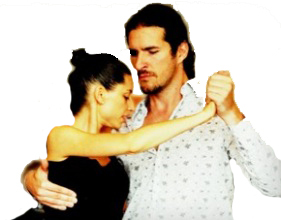 Eduardo also teaches and runs Bristol based Tango Alchemy. Argentine tango has been running in Cardiff since 2000 when Sian and Michael founded the group "Tango Y Nada Mas", the first tango club in Wales. Here they have hosted and learned from many of the best known Argentine Masters. In January 2015 Sian and Michael were delighted to hand over to their Argentine friend and teacher Eduardo Bozzo. This site was last updated on the 15th April 2019.